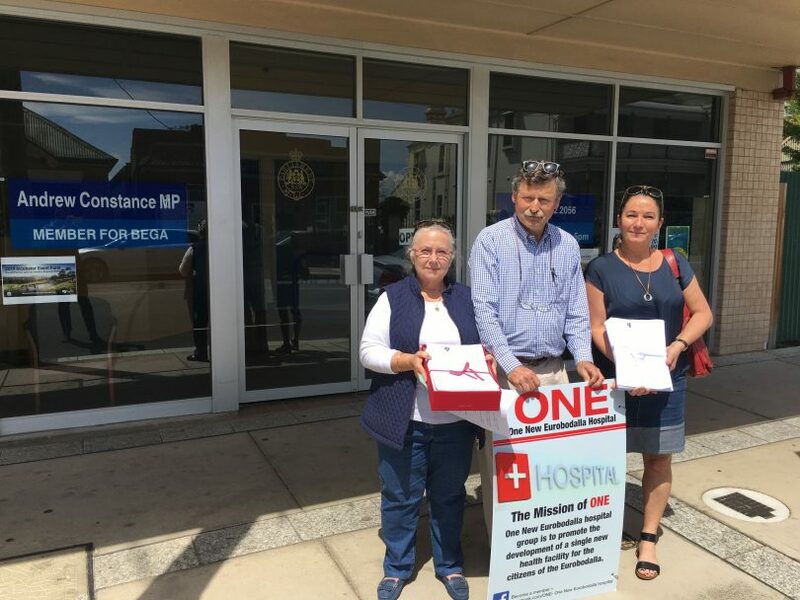 Mylene and Fitzroy Boulting and Georgie Rowley delivering the One Eurobodalla Hospital petition to Bega MP Andrew Constance’s office. Photo: Ian Campbell. Health Minister Brad Hazzard has formally responded to a petition seeking a new regional hospital in the Eurobodalla Shire, praising the energy and dedication of community members who campaigned for the new facility. His response was tabled with the Clerk of the Legislative Assembly in the NSW Parliament. Planning for the new hospital has commenced in recent weeks, and Mr Hazzard said that while a final site has not been identified, Southern NSW Local Health District, Health Infrastructure and the local community will have input for the best outcome. The petition called for medical services equal to the regional and base hospitals within the Southern NSW Local Health District, and improvement of health services in the Eurobodalla Shire during the planning and construction process. Mr Hazzard said that he acknowledged the concerns of the signatories for the health of their community, and welcomed the opportunity to respond. Over 3,000 people signed the ‘One New Eurobodalla Hospital’ petition prior to the NSW Premier’s announcement on October 31 of a $150 million investment to build a new single hospital in the Eurobodalla. Mr Hazzard joined local Bega MP Andrew Constance in acknowledging the work of Dr Michael Holland and the One New Eurobodalla hospital (ONE) movement. The 3000 signatures were collected in a matter of weeks, showing the community’s view and support for a new hospital. “I am advised that the new Eurobodalla Health Service Clinical Services Plan is in development and will assess health services required for the Eurobodalla communities, develop models of care, and identify workforce requirements. Community consultation has occurred and will continue through all stages of location, planning and construction of the new health service”, Minister Hazzard said. A transition plan is also being developed as part of the planning process for the new hospital. This will consider any interim infrastructure improvements that may be required. “I am advised that additional staffing levels are being reviewed and a planning process is underway to ensure resulting staffing levels are balanced. Staffing of the Eurobodalla emergency department has been boosted recently with 1.5 Emergency Department specialists recently recruited. Recruitment is under way for an extra doctor”, Minister Hazzard said.